Kerastase Paris is one of the world's leading hair care brands, and last year they celebrated their 50th Anniversary. They hosted a conference and gala ball in Melbourne and invited their brand ambassadors from around Australia. They were kind enough to invite me to present a perfume master class and create a fragrance to give as a gift to their guests. I was to present after Ita Buttrose and Megan Quinn, so I was in excellent company! Before I began preparing my presentation, the first thing to do was to create the fragrance. I worked with my perfumer to create a fragrance using the scent of a signature Kerastase product as inspiration. My suggestion of diffusing the fragrance into the room during the conference was enthusiastically accepted. I work with Dan from Scent Australia on all of my sensory branding projects and he supplied me with two units that we positioned behind some signage in the front corners of the room. This placement allows the fragrance to disperse throughout the room evenly. The fragrance was set quite low, just enough to give the guests a hint of the fragrance without it being too overpowering. Now to the presentation. 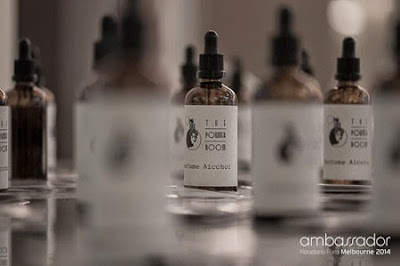 I started with the history of fragrance, and how the perfumer trains and then creates fragrance. I touched specifically on the use of fragrance in hair care and explained why using fragrance in hair care can enhance the pleasure of the customer as well as mask the use of chemicals. We then explored the fragrance families and I taught my guests the basics of perfume creation using the Olfactorium, a traveling perfumers organ from our partner in Paris, Cinquieme Sens. Everybody loves this part of the class and starts hashtaging away on social media! After the event, Kerastase wished to gift their guests with a bottle of the fragrance to say thank you for attending. 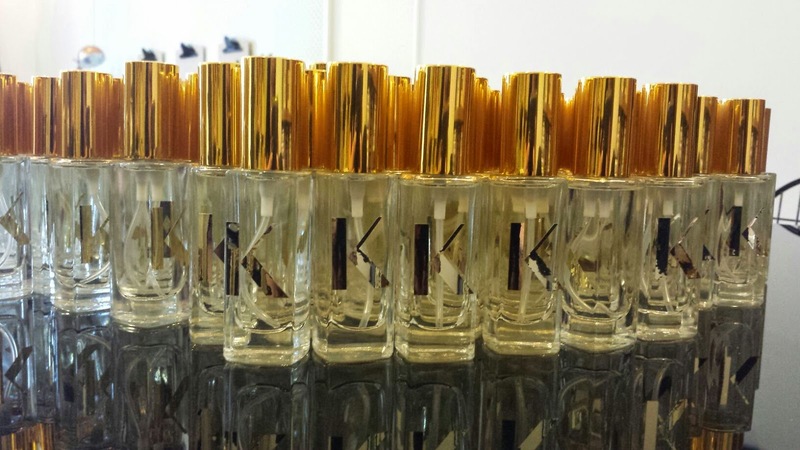 We used the fragrance we had created, decanted it into bottles with a gold lid and we applied custom made 'K' stickers on to the bottle.